I am a keyboard musician, pipe organist,singer, composer and choir conductor. 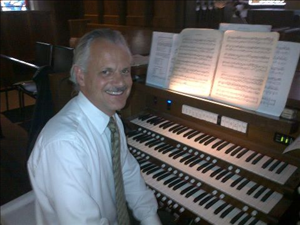 I graduated from the University of Calgary with a Bachelor of Music degree in Theory and Composition and have been Music Director for Sacred Heart Church in Calgary for 30 years. As well, my experiences have included playing in various rock, jazz, blues and classical groups and formats. I have been a piano and theory teacher for nearly 30 years teaching privately in my own studio. I have recording experience and have recorded and preformed many of my own and others recordings. I am available as a wedding and funeral sevice musician and work regularly in this capacity for various churchs and funeral companies in Calgary.